In cooperation with the responsible TenCate marketeers, communications professionals and management we all have tackled the development process by an extended inventory of all materials available, inspiring external artwork and client cases as well as various methods of associative analyzes to formulate the foundations of the new Brand Architecture. These foundations have been visualized on mood boards. The final selection resulted in elaborated concept ideas representing until today the collective identity of Royal TenCate. The TenCate concept enables each division to clearly present itself as well as its portfolio. The division specific product portfolio is presented on eye level close to the visitor. The TenCate brand is clearly visible from a greater distance. 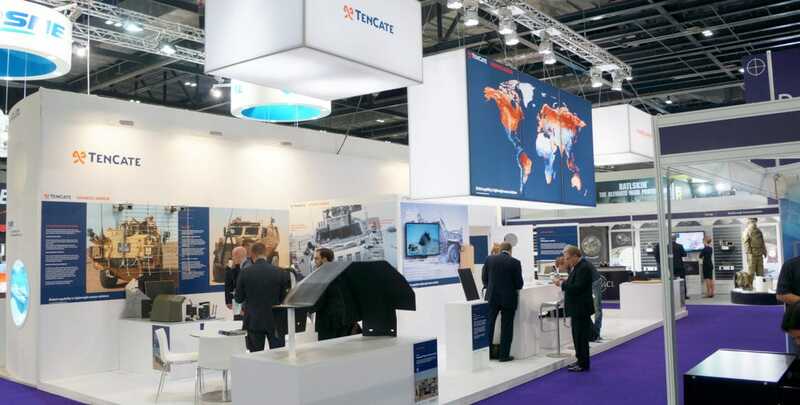 During the preparation phase, TenCate can fully focus on product presentations and storytelling specific for each exhibition or trade show, without having to worry about the overall look and feel. This resulted in a better ROI for each trade show whilst saving money on stand building and maintenance.